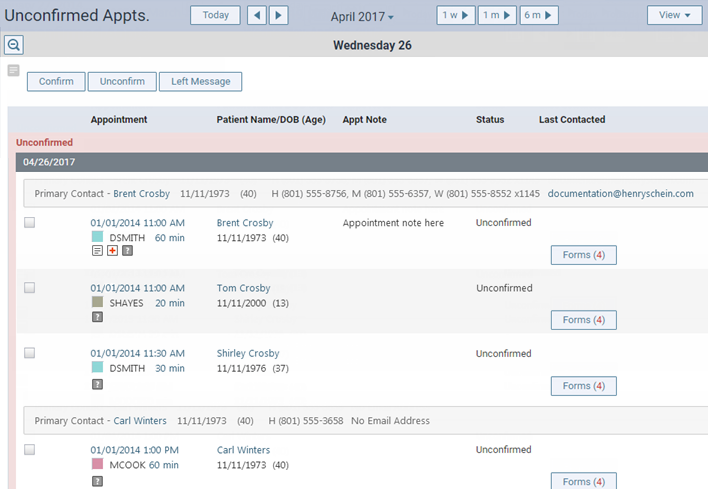 You can use the Unconfirmed Appointments List to contact patients or households and remind them of upcoming appointments. On the Unconfirmed Appts page, navigate to the day or week for which you want to confirm appointments. Under Unconfirmed, as you go down the list of appointments, use the phone numbers and/or email address displayed for the primary contact person of each household to contact that household, and select the check boxes of the appointments for patients who you get confirmation from or leave a message for. You can also view a patient's completed patient forms and send a request for the patient to complete patient forms. 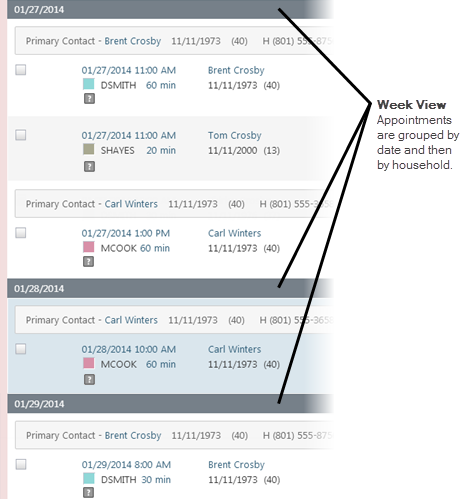 On the View menu, you can choose to view appointments by day or week. If you are viewing the list for a day, appointments are grouped by household and then listed chronologically. If you are viewing the list for a week, the appointments are grouped by date and then by household and then listed chronologically. On the View menu, you can choose to view appointments for specific providers. Click (or tap) Confirm or Left Message. Confirmed appointments move from the Unconfirmed section to the Confirmed section, and their statuses change from "Unconfirmed" to "Confirmed." Appointments that you left messages for stay in the Unconfirmed section, but their statuses change from "Unconfirmed" to "Left Message." If you need to move any appointments that were confirmed previously back to the Unconfirmed section, under Confirmed, select the check boxes that correspond to those appointments, and then click (or tap) Unconfirm.